LOWER MANHATTAN, New York (WABC) -- New details are emerging about the truck rampage suspect's apparent plan to carry out a deadly Halloween attack in New York City. Prosecutors said 29-year-old Sayfullo Saipov was inspired by ISIS videos he had watched on his cellphone. He started planning the attack about a year ago while in the U.S. -- and two months ago, he decided to use a truck. The plan was carried out on Halloween because he believed there would be more people on the street, investigators said. 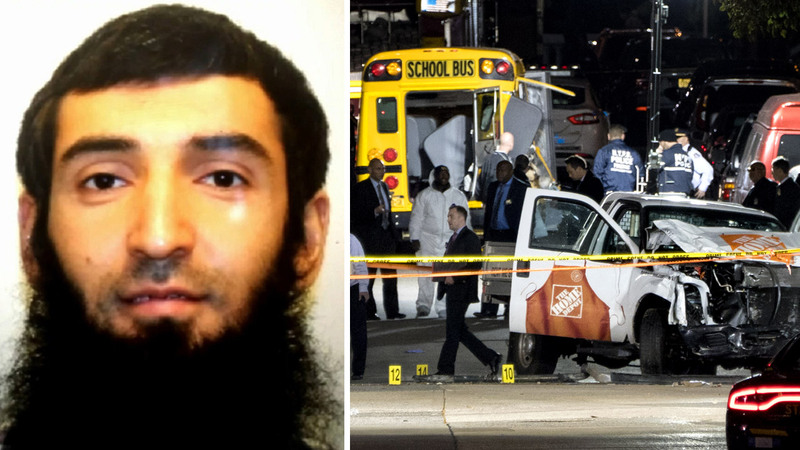 The plan he executed followed instructions ISIS posted online for a truck attack "to a T."
Video and still images from traffic and surveillance cameras along the route of the attack show Saipov drove the rented Home Depot pickup truck carefully -- and at moderate speed -- until he entered the bike path at Houston Street in Lower Manhattan and accelerated. The nearly one-mile-long attack that killed eight people and injured about a dozen others spanned about a mile, before the suspect crashed into a school bus and took off. As he ran, police said he waved two fake guns and an NYPD officer shot him in the hip. He's expected to survive. Eyewitness News obtained video taken by a Stuyvesant High School student that shows the driver running erratically around in the street, in between passing cars, dressed in dark clothing and carrying the weapons. Investigators said Saipov rented a truck on October 22 -- nine days before the bike path attack in Lower Manhattan -- so that he could practice making turns. His plan was more elaborate than what was carried out. Prosecutors said he planned to drive onto the Brooklyn Bridge after the bike path attack to continue to hit more pedestrians, but was stopped after he struck the school bus and the truck became inoperable. Saipov even planned to drive around with ISIS flags on the truck, but decided against it to not draw attention to himself, court documents said. While in the hospital after his capture, he asked to fly an ISIS flag in his hospital room and said "he felt good about what he had done." Following the attack, officers recovered various items through their investigation. The two fake guns Saipov was allegedly carrying were identified as a paintball gun and a pellet gun. From inside the rental truck, officers also recovered three knives, a wallet with a Florida driver's license, two cellphones and a stun gun. A handwritten note investigators found was 10 feet from the driver's door of the truck and contained both Arabic and English text. The Arabic portion of the note said "No God but God and Muhammad is his Prophet" and "Islamic Supplication. It will endure." "It will endure" refers to ISIS. -- On cellphone 2, they found Internet searches for the Home Depot in Passaic (done on October 4), a search for "Halloween in nyc" (on October 15) and a search for Home Depot truck rentals (on October 18). Prosecutors announced federal terrorism charges against Saipov late Wednesday, which means he can get the death penalty if convicted -- even though New York state has no death penalty. Officials say Saipov entered the United States through JFK Airport from Uzbekistan in 2010. He came under what is called the 'Diversity Visa Program,' which offers a lottery for people from countries with few immigrants in America. He had a green card that allowed permanent legal residence. After entering the country, he reportedly went from Ohio to Tampa, Florida and then to Paterson, New Jersey, where he lived with his wife and three children for several years. Saipov was also the registered statutory agent for a pair of Ohio-based trucking companies: Sayf Motors Inc. in Cincinnati, and Bright Auto LLC in Cuyahoga Falls. Uber confirmed that Saipov had worked as an Uber driver, and the company said he had passed a background check but has since been banned from the app. "We are horrified by this senseless act of violence," an Uber spokesperson said in a statement. "Our hearts are with the victims and their families. We have reached out to law enforcement to provide our full assistance." Candace McCowan has the latest developments in the truck terror attack.